Introducing Gorton's Artisan Recipe Fillets. Real wild-caught Alaska Pollock. Real bold ingredients like chilies, peppercorns, garlic and lemon. Real crunchy breadcrumbs made with Italian bread, crushed tortilla chips, and Panko breadcrumbs. All expertly prepared in Gorton's Artisan Recipes. Gorton’s Artisan Fillets are available in Roasted Garlic & Italian Herb, Lemon & Cracked Peppercorn, Southwest Tortilla and Southern Style varieties. For my review, Gorton's sent my family Five full-value product coupons to purchase Gorton's NEW Artisan Fillets and One Gorton's branded cutting board! Real wild-caught Alaska Pollock. 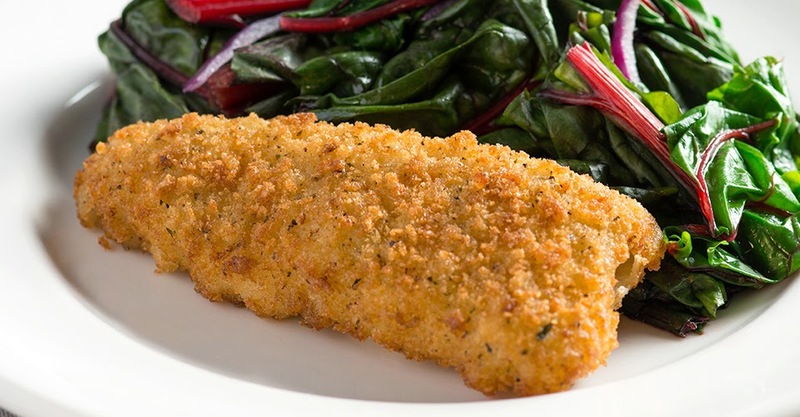 Real ingredients like roasted garlic, Italian herbs and savory breadcrumbs. Bold seafood flavor has never been easier. Authentic Artisan Recipe Real Roasted Garlic & Italian Breadcrumbs 160 calories per fillet, No fillers, MSG, artificial colors or flavors. I made this for lunch and my girls absolutely LOVED it! So much in fact, that they asked for SECONDS! Real wild-caught Alaska Pollock. Real ingredients like Southern spices and a crunchy corn coating. Bold, delicious seafood has never been easier. Authentic Artisan Recipe, A savory blend of Southern Spices & a crunchy corn coating, 170 calories per fillet, No fillers, MSG, artificial colors or flavors. This flavor was delicious and a HUGE hit! It went perfect with rice and veggies, it has a nice blend or herbs and spices that I really found quite tasty and everyone asked for SECONDS! Gorton's Artisan Recipe Fillets taste awesome. They are super easy to make as well, just pop them in the oven to bake for about 20 minutes - The breaded fillets came out crispy and you can tell they are actual fish! Gorton's is giving ONE of my lucky followers the chance to win Two (2) Gorton's full-value product coupons and a Gorton’s cutting board. This giveaway is open to residents of the US only. Ends 3.21.14. Be sure to visit gortons.com to download a coupon, find recipes and explore products. Gorton's Seafood is currently running a SWEEPSTAKES and you are invited to enter! Check out Gorton’s Real Solutions Sweepstakes by clicking HERE. DISCLAIMER: All products received are complimentary for testing purposes from Gorton's Seafood. All opinions stated are my own and are not influenced by any affiliates. I am not a seafood person . . . at all. However, my hubby would love if I'd win these for him! He likes the beer battered fillets. Great giveaway. I love their grilled salmon. That cutting board looks nice and solid too! Thank you for sharing the giveaway. I had no idea Gorton's had such a wide variety. I would like to try the breaded clams. I love their grilled salmon and fish! I would love to try Grilled Fish. I would love to try the GARLIC BUTTER SHRIMP SCAMPI. I'd love to try Clams and butterfly shrimp!! Grilled Seafood Lemon Butter Grilled Salmon!! because i am terrible at cooking salmon! The Crunchy Breaded ones look like they would be delicious! Oh that looks so good. I really hope Gortons comes out with a gluten free battered shrimp soon. I love shrimp and would love an easy to cook prebattered shrimp again.